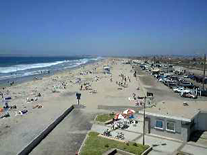 In 1885, the Coronado Beach Company was formed to develop the resort potential of the area. 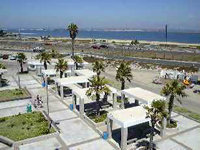 The first recorded development of the area was a road graded across the strand in anticipation of eager buyers. In 1889, the Coronado Railroad Company placed a steam train in the area connecting the Coronado Hotel with the Coronado Pier. The train circled the bay over the strand on to Coronado Heights (Imperial Beach), the South San Diego Saltworks, National City, and on to San Diego. Passengers and freight were transported, as was the hotel’s garbage, which was taken to a nearby "hog farm," where hogs, chickens, and produce were raised for the Coronado Hotel’s restaurants. The railway line was acquired by the San Diego and Arizona Railways Company shortly after World War One. The rail line is now abandoned. Following the financial crash of 1888, the Coronado Beach Company was sold to the J.D. and A.B. Spreckels Investments and Securities Companies. In 1931, the Spreckels holding companies gave the land that became Silver Strand State Beach State Park to the California State Parks Commission. In 1936, the California Department of Parks and Recreation purchased 32 acres at the north end of the bayside from the U.S. Army. The U.S. Navy took over the bayside parcels during the later summer of 1941 and, during the war, dredged the original parcels of land almost out of existence, creating a larger parcel of above-water property in the tidal flats. The ocean-side 40-foot strip remained in state ownership and, in fact, grew as bay dredging for naval purposes dumped millions of tons of sand onto the beaches on both sides of the highway, creating an extensive "new" beach. In 1955, the State Lands Commission gave the California Department of Parks and Recreation all of the "artificially accreted lands and tide and submerged lands," creating a large addition to Silver Strand State Beach. In 1959, the California Department of Parks and Recreation and the U.S. Navy settled a dispute over the ownership and use of land at Silver Strand State Beach. The Navy retained the original bayside parcels (altered and enlarged by dredging) and now leases a portion of the northern part of the property.